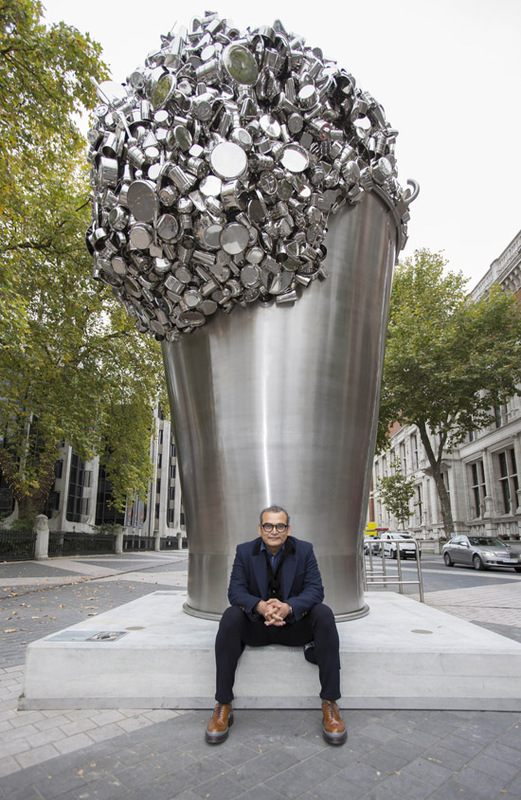 London is graced by a dazzling new public artwork by Indian artist Subodh Gupta. When Soak Becomes Spill alludes to things even bigger than its giant presence out on the street. A huge shiny object has appeared on Exhibition Rd in London's South Kensington. Has a giant placed a vast metallic tumbler there, overflowing with perhaps mineral water or a seltzer? No - this is When Soak Becomes Spill, a work by Delhi-based artist Subodh Gupta, installed by the V&A Museum in the middle of the road until 31st January as part of its India Festival programme. 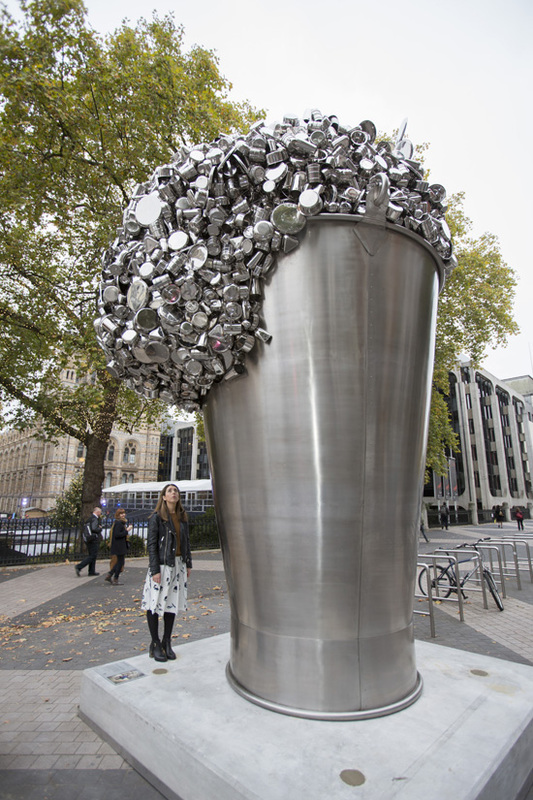 The stainless steel bucket is six metres high, and a host of haphazardly angled silvery pots overspill its rim, glinting even in dull light. The work has a spectacular and refreshing effervescence. Does Spill refer to 'Shining India', the national booster phrase widely used during India's fairly recent high-growth years? No, Gupta says, rather 'it's a metaphor for many things: my artistic expression, population, society...' With India's booming population set to overtake China's perhaps as soon as 2022, the sculpture brilliantly reflects how there's something out of control yet fizzing with energy about the country's future. 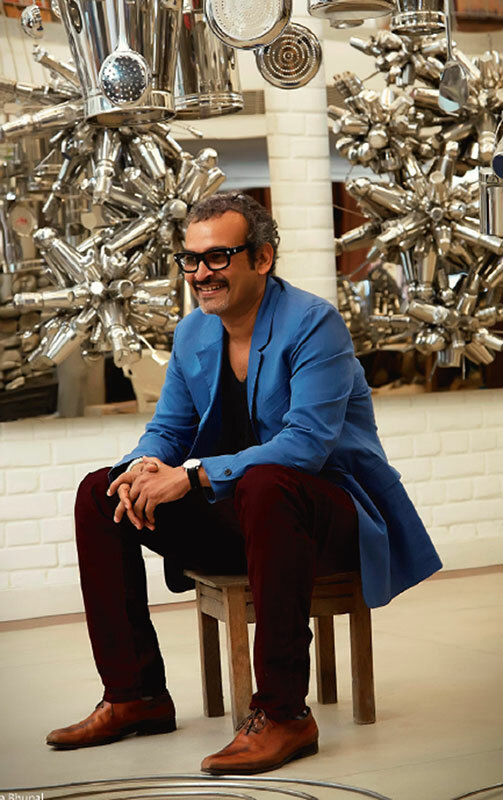 Gupta works in other media such as photography and performance, but it is his sculptures that have made him a big name on the global art stage. They have long incorporated metal objects from day-to-day Indian life - food pots, pans, cooking utensils, milk pails - and other objects such as bicycles have been plated to sheen in silver, copper or brass as well. (It makes a change from cow dung, another ubiquitous feature of India, used in earlier Gupta works). Gupta follows Marcel Duchamp, a major influence, in making us look at mundane things afresh. But he is far more celebratory. The new work is a descendent of Spill (2007), but that was only 1.75m high. Although it refers to washing, When Soak Becomes Spill is, in a way, like a drink that says 'cheers!' to life!